The IRS gives taxpayers an extension when it comes to filing their tax returns. However, this extension does not apply to any liabilities owed by taxpayers, so all payments were supposed to be submitted by mid April. Many taxpayers were unable to meet this deadline and so are now receiving tax bills because, although they filed on time, they did not pay in full. Fortunately, the IRS provides a number of options for taxpayers who owe money to the IRS. To find out more about these options and which ones best suit your needs, please contact an experienced unfiled taxes attorney who can advise you. Paying by check or money order, either in person, or through the mail. These options may not apply for taxpayers who are still unable to pay the full amount they owe to the IRS. Fortunately, even in these cases, the IRS offers a variety of payment options. The offer in compromise plan, which allows taxpayers to settle their tax bill for substantially less than they actually owe. Non-Collectible status whereby NO payment is made to the IRS because under IRS Guidelines your reasonable living expenses exceed your income. Bankruptcy can under certain conditions discharge an income tax liability in full. Unfortunately, even when a taxpayer comes to an arrangement with the IRS, the agency may still file a Notice of Federal Tax Lien on the taxpayer’s property. This essentially establishes that the IRS has priority when it comes to competing with other creditors. 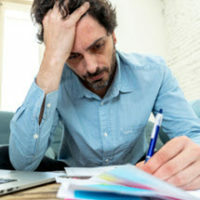 Once these liens are filed, they may appear on a taxpayer’s credit report, which can have a negative effect on his or her credit rating overall. For this reason, working to resolve tax liability as quickly as possible before filing a lien becomes necessary is critical for taxpayers. Please contact 386-490-9949 today if you have questions about your own unpaid taxes and our legal team will help you schedule a free one-on-one case evaluation with experienced Florida tax attorney Ronald Cutler, P.A.